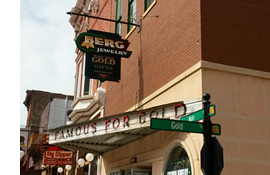 Founded in 1998, Berg Jewelry is located within the beautiful Black Hills in the Historic city of Deadwood, South Dakota. Family owned and operated, we take pride in offering the finest selection of Black Hills Gold, Silver, Jewelry and gifts. Our goal is to provide our customers with the widest selection and best prices possible. Here at Berg Jewelry we believe that customer service is the most important aspect of our job.